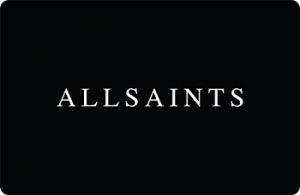 All Saints was founded in 1994 and has over 145 stores around the world selling a very distinctive range of quality women’s and men’s clothing. Named after the All Saints Road in Notting Hill London, All Saints has built a loyal following of customers. The business was originally started as a wholesale retailer of quality menswear to the likes of Harrods. The brand developed and expanded into womens-wear going from strength to strength; now more than half of All Saints product is exported overseas. Where can I check my All Saints giftcard balance? 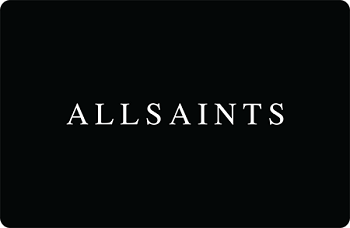 You can check your All Saints giftcard balance on the All Saints website, here. You can hand the card to a staff member at any All Saints UK store to receive the balance. Click here to find your nearest All Saints store. Where can I buy an All Saints giftcard? The card can only be used in UK stores – it is not valid in stores that trade in different currencies. The card is not available for use in All Saints concessions, such as those in Harrods. The card can be spent online at the All Saints website. The All Saints gift card will expire 24 months from the date of the last transaction. If the gift card is allowed to expire, you will lose any balance that remains on it. Note that for the purposes of working out the expiry date, a balance check doesn’t count as a transaction, only purchases and refunds extend the expiry date – so don’t get caught out.